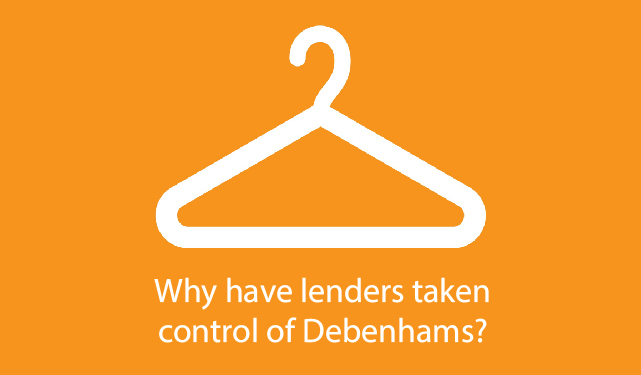 Why Have Lenders Taken Control of Debenhams? The UK’s biggest department store entered into a pre-packed Administration on Tuesday, rendering shareholder’s investments worthless as the company passed to a new company owned by Debenhams’ lenders and bondholders. The UK’s biggest department store entered into a pre-packed Administration on Tuesday, rendering shareholder’s investments worthless as the company passed to a new company owned by Debenhams’ lenders and bondholders. The new owners, which include high street banks like Barclays and the Bank of Ireland as well as US hedge funds, took control of the 165 stores in return for reducing the company’s debt pile, which was in excess of £600m. Debenhams has announced that it had earmarked 50 stores for closure, but it hasn’t indicated which stores could face the chop. Sports Direct boss Mike Ashley, who lost his 30% stake in the company when it entered Administration, said that the process was “nothing short of a national scandal”. Ashley had made a £150m offer for the department store, which was later upgraded to £200m, but one of the conditions was that he would be appointed Chief Executive of the company. It has been reported that Sports Direct has threatened legal action over the administration process. In particular, they took issue with the appointment of FTI Consulting as administrators. Sport Direct lawyers have called for the insolvency process to be reversed, arguing that FTI cannot behave independently because they were engaged in February by the group’s lenders. Umbrella Insolvency Licensed Insolvency Practitioner Tom Fox said: “The department store’s lenders have taken control of the business and will probably look to sell it on. Before they sell, they will probably look to close some of the most unprofitable stores and possibly reduce rents at some stores or file for a CVA to reduce running costs. “Mike Ashley and the rest of the Debenhams shareholders have been the big losers from this announcement. The Sports Direct boss has made a habit of throwing his weight around in these kind of high profile negotiations. “The retail magnate bought the struggling House of Fraser last year and has been linked with takeovers of HMV and Patisserie Valerie this year. “Debenhams bosses must have worried about what would happen if they had named Ashley as Chief Executive. “Sports Direct’s call for the insolvency to be reversed is certainly unusual, but administrators do have a responsibility to behave independently. It will be interesting to see if Ashley’s legal challenge is taken seriously by the concerned parties. For more information on company insolvency, speak to a member of the Umbrella.uk debt advice team today. Call: 0800 611 8888.